The Dons are understood to be on the brink of completing a deal for 29-year-old Gleeson, who has been capped four times by his country. The midfielder is a free agent after leaving Ipswich Town at the end of the season. But Dons manager Derek McInnes was left frustrated last night after Ross County right back Naismith joined Peterborough United. McInnes had been trailing the defender for weeks in the hope of bringing the former Scotland under-21 international to Pittodrie. The Reds are understood to have made a player plus cash offer for Naismith, who was voted County’s players’ player of the year last term. But the 23-year-old has joined the English League One side on a three-year deal after the Staggies accepted a £250,000 bid for the former St Mirren player. The right back’s former St Mirren manager Jack Ross was also keen on a reunion at Sunderland and Peterborough assistant manager Paul Raynor was thrilled to win the race to land Naismith, who was voted County’s players’ player of the year last term. He said: “We are delighted. This is a big one for us and we have all worked hard to get Jason into the football club. He is a much sought-after player. Everyone can see he has been linked with a lot of clubs in the newspapers and the calibre of clubs that have been interested. “We have sold him the dream of what we want to achieve here and he is pleased to put pen to paper with us. Naismith was looking forward to the challenge of playing in English football. He said: “I feel it is the right time for me. 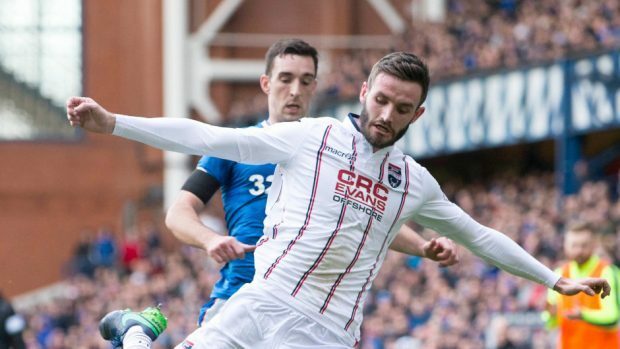 I really enjoyed my time at Ross County but when I spoke to the manager here (Steve Evans), he told me about his plans and I am looking forward to playing in League One and visiting some good teams and stadiums.